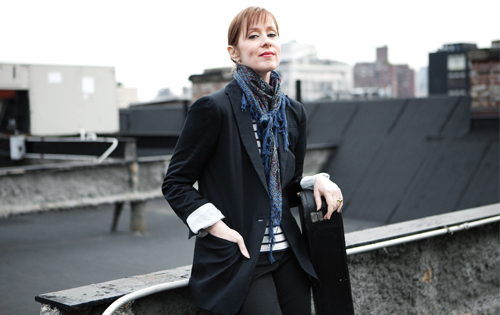 On October 29th, Suzanne Vega played the Bad Bonn, in Düdingen, Switzerland. She interpreted a set of songs from her whole career with new arrangements. For this tour, Suzanne plays in duet with Gerry Leonard, a guitarist that has played among others with an unknown artist called David Bowie. She also played some new songs that will appear on new album in 2014. She tells us about it before her show. How the idea of making the close-up series, a re-recording of your back catalogue, came to you? In 2008, my record contract with Blue Note came to an end. So I had to make a decision what to do, how to go forward. Was I going to write 10 new songs and trying to get a new deal or to make my own record and put it out myself? I thought: “No, let’s record my old songs”. 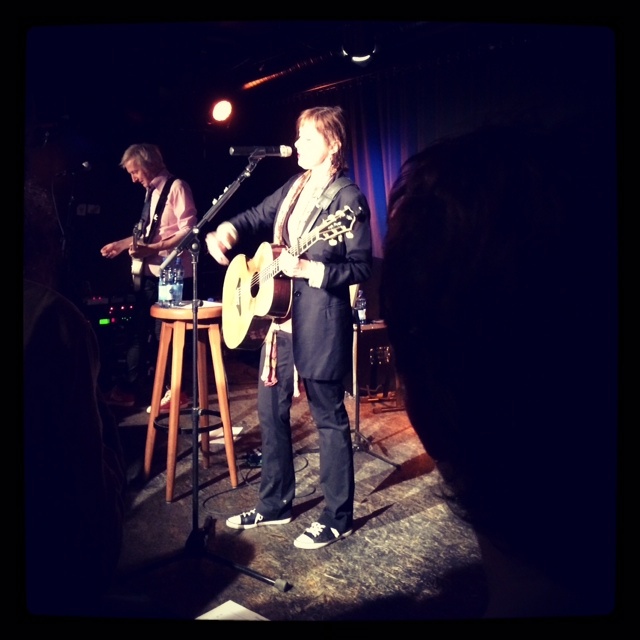 One because it’s good for fans, it’s an intimate recording and I enjoy when other songwriters do that. Two I did it because I thought it was a way of reclaiming my work. I can have the physical copy of the work, which means I can sell it at shows, I can promote it, send it to radio, remix it, license it. Over the years, I got about 100’000 people following me on facebook, so when I make a new album, I have someone to tell. When you record these songs, is it for you a travel back in time – so a very introspective work – or do these songs have a life and thus evolve and get a new meaning for you? They tend to have a new meaning. A lot of the songs I performed them over and over again. There’s nothing nostalgic about them for me. I’m not brought back to 1987. I have more perspective on some songs. The most distance between myself now and the time I wrote a song is with Ironbound. I wrote it when I was 26 years old, avoiding a marriage and now I’m 54 and I had 2 marriages. When we listen to the Close-up series, we have the impression that you sing in our living room. It was done deliberately. Joe Blaney, the engineer that I chose had a way of recording the sound specifically for ear buds. Most of the time when you mix a record, you do it to sound good on the radio. Someone asked me once: “When you say Close-up, how close do you mean?” In your ear, that’s how close I mean. Are you into studio technical stuff to tailor the way you want a song to sound? With the people I’m working with, I’d like to find out first of all what is their esthetic. I wouldn’t say I have a particular esthetic that’s my own. With my next album for example the sound is much more blended, it’s all played in a room together, a little more rootsy, a little more American sounding. In the 90’s, you worked with record/mixing engineer Tchad Blake. He has unorthodox methods. Can you share an anecdote with us? Oh there are many. He came back from India with a sound system. With Mitchell Froom, who produced the records, they would take my vocals and put it on these speakers in the bathroom. So I would sing in the studio but it would be coming out in the bathroom. They would record it that way for the sonic sound of it. His way of mixing really is like sculpture. I’d never really seen that before. He makes sculpture also with objects with his hands and you can see the same esthetics in his sculptures that you see in his mixes. You feel the presence of things moving towards you. You really feel you are in a space. David Byrne recently wrote an article about New York and how it must keep its audacity, because it is its identity. He’s worried about NY losing it. What do you think about it? Back in the ‘80s it’s true there was this great vibrant music scene. I still go to see music, but it’s not the same kind of scene. But a lot of the punks – Patti Smith, even Lou Reed – were saying that New York was so great in the ‘70s and was so much kinder to artists. I never experienced New York being kind to artists. My father was a novelist and short stories writer and we were evicted from our house in 1979. I’ve never experienced that warm embrace of New York City towards artists. And I don’t feel nostalgia for the ‘70s or ‘80s, I’m happy to be here now. I will release a new record in February. There’s some work to do to get it set up. We did a photo shoot before I left, so now I have to design the album. The new songs are really like ten stories about where the body meets the spirit. You are now an indie artist. What has changed in the process of everything that surrounds music, like promotion? It’s definitely more indie. Now it’s me financing everything. Everything’s done on a shoestring: how cheap can you get it? I do my own make-up, because I don’t want to pay for some girl to come in. Everything’s much smaller that it has ever been. Which is good and bad. Good because it’s handmade and your hands are on everything. Bad because you don’t have the sense of power and connection that one used to have. It fits my own songwriting esthetic, it has always been hands-on and writing about those things in front of you. This is the “cool jazz” song of the album, featuring a guest appearance on alto sax. The song’s about what it feels like to be a photographer trying to catch everyday life in the streets without being noticed. Being transparent. I tend to think that you can often get more interesting photos when people are not posing. It’s called 41, because color films are processed in a C41 bath. “A T in a park, an A-class driving his W on a sunny day. There was a beautiful light, I had my M1 with me, C41 is always looking magnificient”. Here’s a live version of Damien Rice’s Rootless Tree, that he recorded for a tv channel. This song is from his second record, called “9”. It shows Damien Rice’s music at his best: cool songwriting, deep interpretation, for a very emotional result. Ok, we don’t feel like listening to Damien Rice anytime, because it’s mostly sad songs and of course it’s not suited for any occasion. But listening to his 2 albums, it’s clear that there’s not a lot of stuff to get rid of – if any – because he can write and interpret songs with a real intensity and authenticity that you don’t find a lot anywhere else. His way to build his career is also quite interesting and honest. He recorded and mixed himself his 2 albums, recording at various places and houses. Once again this “Do It Yourself” road that we’re used to hearing a lot these days but here there’s nothing to do with marketing and the way to sell an artist. The production and recording work in “9” is really better than what he did in “0”, but the songs in “0” have such a quality that you soon forget about this lack of recording and mixing techniques that would have made it a “classic” album, so to speak.